Vintage Inns (Mitchells and Butlers) pub/restaurant in Old Coulsdon, halfway between Coulsdon and Caterham. Located on Coulsdon Common, right next to the route of the London Loop, it's understandably popular with walkers. Water bowls are provided for dogs, and there's quite an extensive beer garden. It's as much a restaurant as a pub, with drinkers confined to a 16-seater area near the bar photo. The dining area is much more extensive, with plenty of seats. Each area has a log fire. bob visited on a Monday Bank Holiday lunchtime in January 2017. It was already very busy when I got there, with a constant stream of people arriving including lots of hikers from the common, and when I ordered food I was told there was a 30 minute cook time. 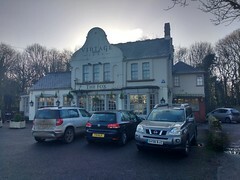 There were three real ales on: Everard's Sly Fox (£3.85/pint), London Pride, and Sharp's Doom Bar. My pint of Sly Fox was a short measure; I didn't ask to have it topped up because the bar staff were very busy. I went for the fish finger sandwich (£5.75 including straw fries) photo. The "fish fingers" were actually battered goujons photo, but were decent enough; and the "sandwich" part was a toasted roll. It came with a decent tartare sauce. The straw fries came skin on, and were fine. They had Stokes ketchup instead of Heinz. Child-friendliness: They have several high chairs, and there's nappy change facilities in the accessible toilet. They have a children's menu with a couple of vegetarian options. Accessibility: No steps to get in. Level once you're inside too, and there's a RADAR-locked accessible toilet (which on our January 2017 visit had the key already in the lock). Last visited by bob, January 2017. Opening hours taken from the Vintage Inns website, January 2017. Last edited 2017-01-29 14:09:08 (version 2; diff). List all versions. Page last edited 2017-01-29 14:09:08 (version 2).